TEXT CLUB EXCLUSIVE OFFER – 48 HOURS ONLY! I created PrebioThrive with five advanced prebiotic ingredients to help promote a probiotic-friendly environment in your gut. By helping the “good bacteria” in your gut to flourish, PrebioThrive supports healthy digestion, energy levels, and overall feelings of wellness. 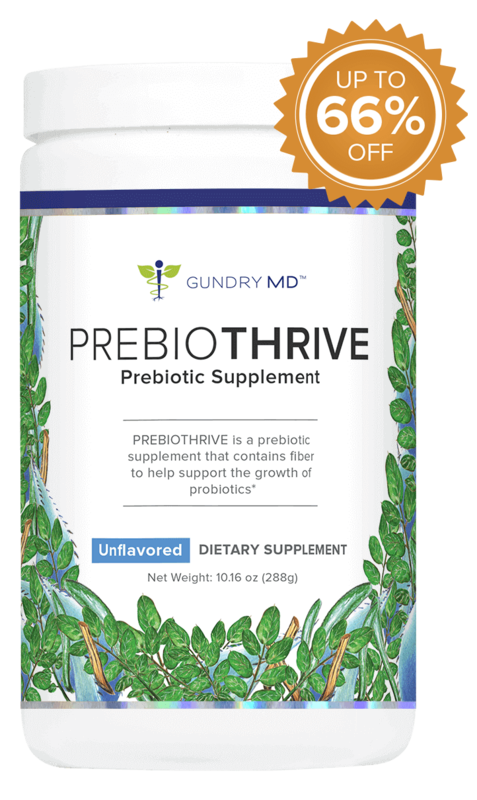 What Are The Ingredients In Gundry MD Prebiothrive? To experience the full benefits of PrebioThrive take one scoop daily with beverage or blended drink, preferably with probiotics to create a synbiotic effect. Use it consistently for the best results. This prebiotic supplement is designed to help support digestive health, and strengthen your immune system. It is perfect for anyone who wants to improve digestive comfort and feelings of wellness. PrebioThrive contains only 100% natural and safe ingredients. The formula is tested for quality and purity at an independent, 3rd-party facility. However, as a physician I recommend consulting with your own health care provider before beginning any new supplement. I love this product! It is so easy to use and does not taste like much at all. My digestive issues have improved dramatically since I have been taking it which is approximately 2 weeks now.Thanks Dr. Gundry for a real winner!!!! Excellent product. In less than a week constant bloating is finally gone. My wife and I both use this product and we started after we had a combined weight loss of 105 pounds. Our gut make up was destroyed and out of sync. We are very happy to say this product works. After a few days of using PREBIOTHRIVE I felt increased energy! I was so impressed I bought it for my daughters too.